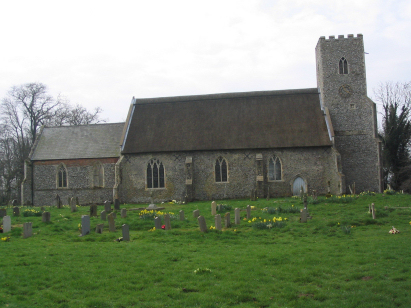 The parish of Paston lies in North-eastern Norfolk close to the North Sea (less than a mile) and north-east of the market town of North Walsham. The village of Paston lies slightly inland from the sandy low cliffs of this part of Norfolk just south of the seaside resort of Mundesley. The parish was tiny, there are numerous other parishes within a few miles of the village. What remains of Paston village is a string of farms and cottages along the narrow winding coastal lane which connects Mundesley south to Bacton & Walcott. St Margaret's church lies at the south-eastern end of the village, close to Paston Hall - an indication perhaps that this was a closed parish. 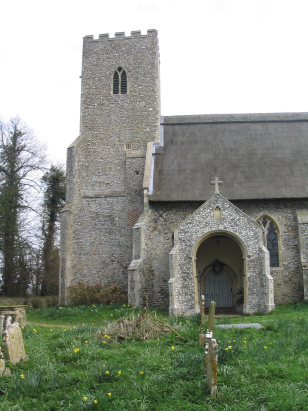 The church is unusual for Norfolk in being entirely of the Decorated style; this is also indicative of an early date preceding the big church-building era in Norfolk. Much is 13th and early 14th century but as frequently is the case a major restoration in Victorian times masks many of the features that would have been present. Inside are some very large wall paintings dating from the late 14th century notably showing St Christopher. A single standard 800-entry register covers the period of this transcript and indeed continues to completion in 1933. This register is filmed on Microfilm MF1656 in the collection of the Norfolk Record Office and from which this transcript was prepared. This film is a relatively recent completion and as such shows the admirable standards of quality now achievable. As a result this was a straightforward transcript to prepare and it is to be hoped that few errors will have crept into its preparation.